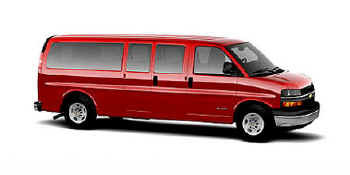 Powerful and versatile, Chevrolet Express is a proven passenger hauler that is able to accommodate up to 15 passengers. It�s also a reliable and durable commercial cargo van and forms the foundation for conversion vans. For 2008, Express delivers a higher level of safety, a freshened interior that includes a new driver information center and the dependable performance of small-block V-8 engines. Chevrolet Express has an impressive roster of safety features that is enhanced for 2008 with the inclusion of a standard tire pressure monitoring system, as well as new flat and convex exterior mirrors that offer a wider field of vision. Standard on all passenger vans and available on cargo vans are head curtain side air bags, providing a higher level of protection in the event of a side impact or a vehicle rollover. For enhanced occupant retention, 12- and 15-passenger models feature Enhanced Technology Glass (ETG). Also new for 2008 are shoulder belts for the center seats on all passenger models. Other Chevrolet Express safety features include four-wheel antilock disc brake system with Hydroboost, dynamic rear proportioning, StabiliTrak, driver and front-passenger air bags and Daytime Running Lamps. All are standard across the Express model lineup. Stable handling, precise steering, superior ride motion control and balance, as well as a quiet, isolated driving experience are hallmarks of the Chevy Express. A three-piece frame features fully boxed sections for superior strength and rigidity, while extended and tapered front frame rails are used for improved crashworthiness. Also, additional tubular frame cross members are used to increase torsional stiffness. Express is available in regular (135-inch / 3,429 mm) and extended (155-inch / 3,937 mm) wheelbase lengths, and can accommodate eight, 12 or 15 people. Cargo vans, available in the same wheelbase lengths, offer seating for two. The cutaways, which can be converted to various commercial, school bus and RV requirements, are available in 139-inch (3,531 mm), 159-inch (4,039 mm) and 177-inch (4,496 mm) wheelbase lengths. The 1500 Series vans include light-duty models rated at 7,200 pounds (3,266 kg) GVW. The 2500 Series includes heavy-duty models rated at 8,600 pounds (3,901 kg) GVW. The heavy-duty 3500 Series includes full-bodied cargo/passenger vans rated at 9,600 pounds (4,354 kg) GVW, and commercial and RV cutaway chassis, with GVW ratings of 9,900-14,050 pounds (4,490-6,372 kg). In all, the new Driver Information Center provides warnings, instructions and reminders and can be viewed in English, French, Spanish and Arabic. Chevrolet Express offers its customers a choice of five gasoline engines, including four small-block V-8 engines. A 195-horsepower (145 kW) Vortec 4.3L V-6 with multi-port fuel injection is the base engine for light-duty Express Cargo. A central fuel injector delivers a separate flow of fuel to six individual hybrid injectors for better performance and improved emissions. The Vortec 4.8L V-8, which cranks out 258 horsepower (192 kW) or 279 horsepower (208 kW), depending on its weight class, and is used for heavy-duty applications in the 2500 Series cargo vans. The Vortec 5.3L V-8 delivers 301 horsepower (225 kW) and 325 lb.-ft. of torque (440 Nm), resulting in segment-leading acceleration. The Vortec 5.3L is the standard engine in G1500 and H1500 Passenger models, and in H1500 Cargo and Conversion models. All 5.3L engines available in Express are E85-compatible, delivering the same horsepower and torque as its gasoline counterpart, while running on E85 ethanol fuel or a mixture of E85 and gasoline. E85 is comprised of 85 percent ethanol, which is a renewable resource fuel produced domestically. The top small-block V-8 offering is the Vortec 6.0L, the segment's most powerful V-8. It delivers 323 horsepower (241 kW) and 373 lb.-ft. of torque (505 Nm). For maximum capability, Express offers the Duramax 6.6L turbo-diesel V-8 engine that delivers 250 horsepower (186 kW) and a class-leading 460 lb.-ft. of torque (624 Nm). It is teamed with the Hydra-Matic 4L85 electronically controlled four-speed automatic transmission, which is specially tuned for diesel-engine compatibility, giving Express exceptional towing and grade capability. The Duramax 6.6L turbo-diesel also delivers a quieter driving experience and enhanced fuel economy. It�s available on G2500 and G3500 Express Cargo Van models. Features such as electronic throttle control, fast-heating glow plugs and easy-service items enhance the driving and ownership experience. With the Duramax 6.6L, Express� maximum GVWR is 12,300 pounds (5,579 kg), with a towing capacity of 10,000 pounds (4,536 kg) � specifications that meet or exceed those of the primary competitor. A 3.73 axle ratio is standard and the RPO G80 limited-slip differential is optional. A fuel-operated heater (FOH) also is available for vans equipped with the Duramax 6.6L to quickly provide heat to the vehicle interior in cold weather. The seamlessly integrated system is designed into the Express chassis, saving customers the time and labor of upfitting an aftermarket system. The electronically controlled fuel-operated heater operates automatically, turning on and off within load parameters that include outside air temperature, fuel level, coolant temperature and whether the engine is running. It features a self-contained, pressurized auxiliary coolant heater (with a surge tank) that uses diesel fuel to generate up to 17,200 Btu/h (5 kW) of heating energy. Chevrolet Express is assembled at the GM assembly plant in Wentzville, Mo.